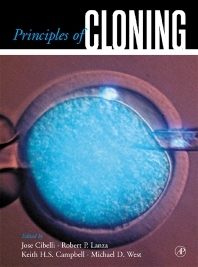 Principles of Cloning is the first comprehensive book on animal cloning since the creation of Dolly. The contributing authors are the principal investigators on each of the animal species cloned to date, and are expertly qualified to present the state-of-the-art information in their respective areas. Editors Cibelli, Lanza and West garnered worldwide spotlight late in 2001 when their company, Advanced Cell Technology, announced the successful engineering of the world's first cloned human embryo. The trio was featured in the US News & World Report December 2001 cover story, "The First Human Clone." The book presents the basic biological mechanisms of how cloning works and progresses to discuss current and potential applications in basic biology, agriculture, biotechnology, and medicine. Bioengineers, biochemists, cell biologists, bone biologists, and geneticists. List of Contributors. Preface. Introduction. Historical Perspective. PART ONE-BASIC BIOLOGICAL PROCESES Activation of Mammalian Oocytes. Nuclear Reprogramming: Biological and Technological Constraints. Plasticity of somatic nucleus by epigenetic reprogramming via cell Hybridization. Cell Cycle. Determinants of Pluripotency in Mammals. Cloning and Aging. PART TWO-METHODS Micromanipulation Techniques for Cloning. Microinsemination and Nuclear Transfer with Male Germ Cells. Development of viable mammalian embryos in vitro: Evolution of sequential media. Genetic and Phenotypic Similarity Among Members of Mammalian Clonal Sets. Genetic Modification and Cloning in Mammals. Pregnancy and Neonatal Care of Clone Animals. Donor Cell Type and Cloning Efficiency in Mammals. PART THREE-CLONING BY SPECIES The Cloning of Amphibians. Cloning of Sheep. Cloning of Goats. PART FOUR-CURRENTLY SOUGHT AFTER SPECIES Cloning of Endangered Species. Cloning of Rats. PART FIVE-NUCLEAR TRANSFER IN PRIMATES Cloning in Non-Human Primates. PART SIX-APPLICATIONS Nuclear Transfer for Stem Cells (CRNT). Current Research and Commercial Applications of Cloning Technology. Transgenic Cloned Goats and the Production of Therapeutic Proteins. PART SEVEN-ETHICAL AND LEGAL AFFAIRS Ethical Implications of Cloning. FINAL REMARKS Mammalian Cloning- Challenges for the Future. Dr. Jose Cibelli is internationally recognized as one of the pioneers in the area of cloning for the production of animals and embryonic stem cells. Dr. Cibelli and his colleagues were responsible for the generation of the world's first transgenic cloned calves, the first stem cells by nuclear transfer in bovine, and the first embryonic stem cells by parthenogenesis in primates. His work has been published in numerous scientific journals including Science, Nature Biotechnology, Nature Medicine, Nature Methods, PNAS, and JAMA. He has testified about cloning in public forums sponsored by the US Food and Drug administration, the USA National Academy of Sciences, Canadian House of Commons, the USA Department of Agriculture, the United Nations Commission for Human Rights and the British Royal Society. He is currently Professor of Animal Biotechnology at Michigan State University, USA.